Unusual, odd, bizarre, weird events. Here’s how it works: the Civil Rights Division at the Department of Justice files a lawsuit in federal court against a city, county, or state, alleging constitutional and civil rights violations by the police or at a corrections facility. It is done under 42 U.S.C. § 14141, a section of the 1994 Violent Crime Control and Law Enforcement Act, granting the attorney general the power to prosecute law enforcement misconduct. The municipality then simply agrees to the judicial finding — without contest — and the result is a wide-reaching federal court order that imposes onerous regulations on local police. IN SHORT, THE MUCH-FEARED NATIONALIZATION OF LOCAL POLICE DEPARTMENTS IS ALREADY BEING INITIATED BY THE OBAMA ADMINISTRATION’S JUSTICE DEPARTMENT. AND SOMEHOW NOBODY NOTICED. The city of Newark, via the consent decree, agreed to the allegations and to implement a “comprehensive and agency-wide policies and procedures that are consistent with and incorporate all substantive requirements of this agreement,” including rules on stops, searches, use of force, etc. The city has two years to implement, with the full agreement lasting five years. Meaning — even if the political parties change power in the city of Newark, the new mayor and city council would still be required to implement the court order. The Department of Housing and Urban Development regulation “Affirmatively Furthering Fair Housing” (AFFH) actually originated as a consent decree in 2009 against Westchester County, New York, requiring affordable housing units to be built in the county. Afterward, Republican Robert Astorino was elected county executive and yet was still required to implement the court order. Westchester became the basis for AFFH, where every city and county in the country that accepts any part of $3 billion of annual community development block grants to 1,200 recipient cities and counties now has to comply with HUD’s dictates on zoning along racial and income guidelines. The terminally ill man who is set to become the world’s first head transplant recipient says more details about his extraordinary surgery will be revealed next month. Valery Spiridonov, a computer scientist from Russia, is set to undergo the risky procedure next year. Today, the 31-year-old is wheelchair reliant due to a muscle-wasting disease, announced his neurosurgeon would explain how the plan was progressing in September. Mr Spiridonov says he is ready to put his trust in controversial surgeon Dr Sergio Canavero who claims he can cut off his head and attach it to a healthy body. Neither the exact date or location have been chosen yet, but the world first procedure is aimed to take place in December 2017. Valery Spiridonov, from Russia, agreed to become the first ever human head transplant patient last time. Speaking at a press conference he said his surgeon, Dr Sergio Canavero, will reveal more about the procedure next month. And speaking at a press conference, he said his Italian surgeon – dubbed Dr Frankenstein – will reveal more soon. Severely handicapped, Mr Spiridonov received worldwide coverage when he volunteered as a guinea pig for the operation. He suffers from Werdnig-Hoffman, also known as spinal muscular atrophy, which can result in problems moving, breathing and swallowing. Most people with the disease die within the first few years of life, but he is among the 10 per cent who survive into adulthood. With his condition worsening every day, he previously told the MailOnline that he wants the chance of having a new body before his disease kills him. He claimed his family fully support his decision to be the first human to undergo such surgery and said: ‘If you want something to be done, you need to participate in it. ‘I do understand the risks of such surgery. They are multiple. The new body would come from a transplant donor who is classified brain dead but otherwise healthy. Dr Canavero has named the procedure HEAVEN, which is an acronym for head anastomosis venture. Anastomosis involves the surgical connecting of two parts. The cost of the 36-hour operation, which could only be performed in one of the world’s most advanced operating theatres, has been estimated to cost £14 million. And he insists all of the necessary techniques to transplant a head onto a donor body already exist. Both donor and patient would have their head severed from their spinal cord at the same time, using an ultra-sharp blade to give a clean cut. The patient’s head would then be placed onto the donor’s body and attached using what Dr Canavero calls his ‘magic ingredient’ – a glue-like substance called polyethylene glycol – to fuse the two ends of the spinal cord together. The muscles and blood supply would be stitched up, before the patient is put into a coma for four weeks to stop them from moving while the head and body heal together. When they wake the patient should be able to move, feel their face and even speak with the same voice. Powerful immunosuppressant drugs should stop the new body from being rejected. Critics say Dr Canavero has simplified the difficulties involved in reattaching a spinal cord and said his plans are ‘pure fantasy’. But if the operation is successful, the pioneering procedure could give new hope to thousands of paralysed and disabled people. 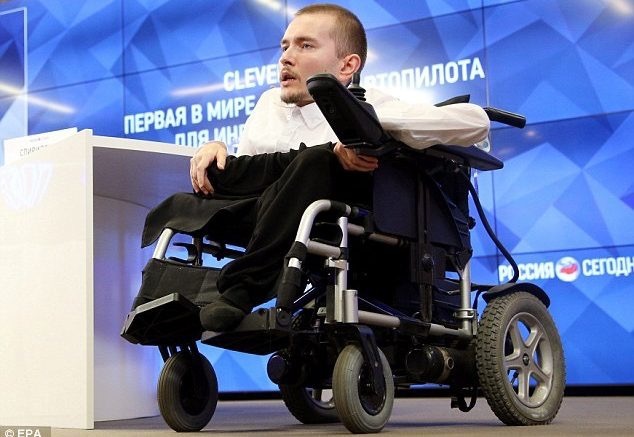 Mr Spiridonov, who is also a tech scientist, presented his autopilot wheelchair system at a press conference in Moscow. His project – called Clever Chair – will improve the quality of life for people who can’t walk. But he said his project is aimed to help disabled people in the masses, and not just individual cases – unlike his surgeon’s operation. Mr Spiridonov is also attempting to raise funds for the surgery himself – by selling souvenir mugs and t-shirts. He has marketed a range of clocks, coaster and caps with the logo ‘Desire for Life’ and showing an image of his head on a healthy, muscular body. The first monkey head transplant was performed 45 years ago and a basic operation on a mouse was carried out in China recently. Dr Robert White transplanted the head of one monkey onto the body of another at the Case Western Reserve University School of Medicine. The monkey died after eight days because the body rejected the head. The monkey was unable to breathe on its own. The animal could not move because the spinal cord were not connected.